A leading group of BFSI industry having a large retail focused model, servicing over 2 million customers, including several lacs of customers for mutual funds, insurance and consumer credit required a communication solution to support its simultaneous calling and heavy call traffic. Mishandling communication can cost a financial service company to misunderstand its client's needs and harm the Customer Relationship. Having large number of customers across varied locations and heavy call traffic, company required a Communication System that can support such heavy call flow and simultaneous calling for each of their employee, thus reducing communication delay. Matrix along with its Delhi based channel partner - Corporate Tele Systems offered ETERNITY LE as a Communication Solution with PRI trunk support to IIFL 's new four floored office accommodating 600+ employees. ETERNITY LE is a compact, single rack solution supporting up to 1500 ports and offers cutting-edge functionality eliminating the need of large power stations and multiple cabinets. 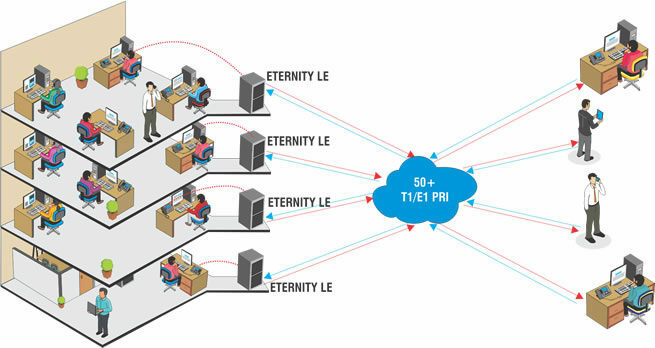 Simultaneous Calling for each employee in the office: With the requirement of 50+ PRI trunk support, customer opted for ETERNITY LE for each floor of their office for simultaneous outbound calling. Support to future scalability plans: ETERNITY LE perfectly sufficed their present user requirement and still kept them open for future scalability plans, be it on trunk or user end.